Serving champagne, cava, prosecco? The differences, why to pick, and what goes with. The natural drink of celebration is a tall, elegant flute of something sparkling. But uh, what specifically sparkling? There’s no wrong answer, but we figure there’s no harm in handing you an answer key to the sometimes undifferentiated wall of options at your local wine store. Champagne, according to many sommeliers, is the little black dress of drinks: it goes with everything, everywhere. That’s reason enough to serve it. And it really is the creme de la creme of sparkling wines. But you shouldn’t feel limited to it, especially since the average bottle of true Champagne (which we assume you know the criteria for: we’ve all seen Wayne’s World, right?) starts at about $40. If you want to serve something Champagnesque, here’s a little cheat: there are many white sparkling wines made with the same grapes, by the same vintners, but on cheaper real estate. You pocket the difference and you’ll still be drinking sparkling wine made by Mumm, Taittinger, Bollinger, and other potent notables. Brillat-Savarin, one of the first food writers, is who gave us the idea that champagne goes with everything, and he has a cheese named after him. That’s good inspiration: think classic, French, and extravagant. 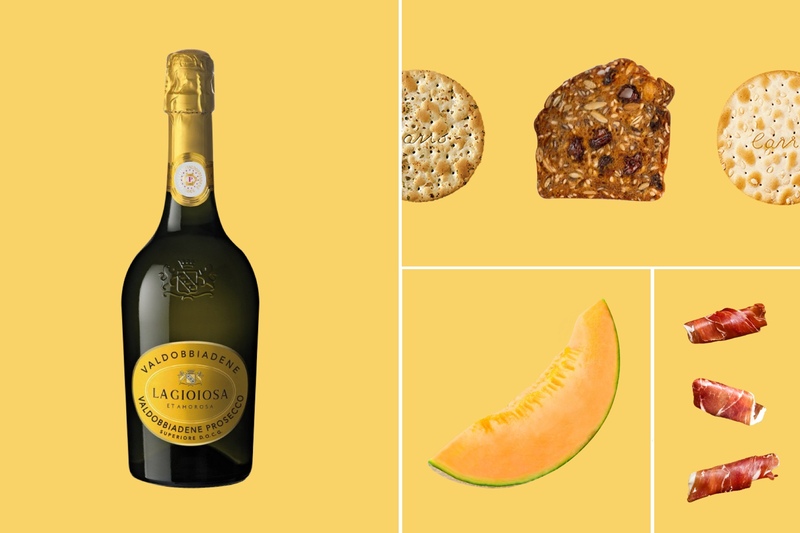 Champagne goes wonderfully with a Gallic cheese plate, especially one with a creamy brie (the wine’s bite contrasts the cheese nicely), dried fruits, fancy nuts, and some little cornichons on the side. Images: Prosecco, Carr’s and Raincoat crackers, Cantaloupe, Prosciutto. Why not, indeed? Despite being as tightly regionally controlled as champagne (to a little village outside Trieste), something about prosecco just feels easier. 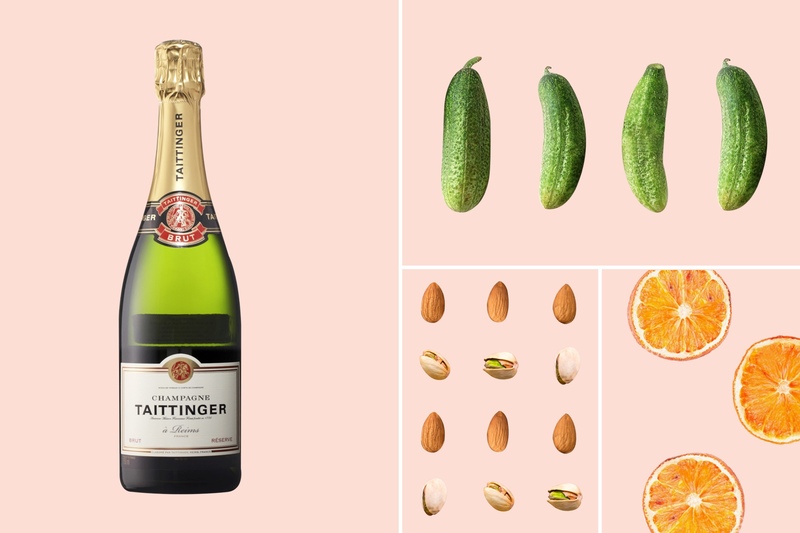 It’s a lighter drink, drier, and even a little crisper than the average sparkling wine. It’s also a lot cheaper. We think prosecco’s chiefest virtue is how well it plays with others, though. It’s great to pick out if you’d like to have it on its own, but we think it’s even better with a friend: in a sparkling wine cocktail, that is. It’s famous in the Bellini and the Spritz, but for fun, absolutely vary your mixers to experiment. Try a fallish pear nectar Bellini rather than the usual peach, or mix and match amaris in your Spritzes. Swap out Aperol for a classic like Campari or a newcomer like Cynar. That menu sounds like it could use a bit of ballast to soak up the booze. Think Italian: they know what they’re doing. Prosecco’s light touch goes well with the intense and varied flavors of a traditional spread of Italian hors d’oeuvres: prosciutto wrapped around melon, conserva and crackers, sharp sheep’s cheese, and other treats from the northern part of the boot. 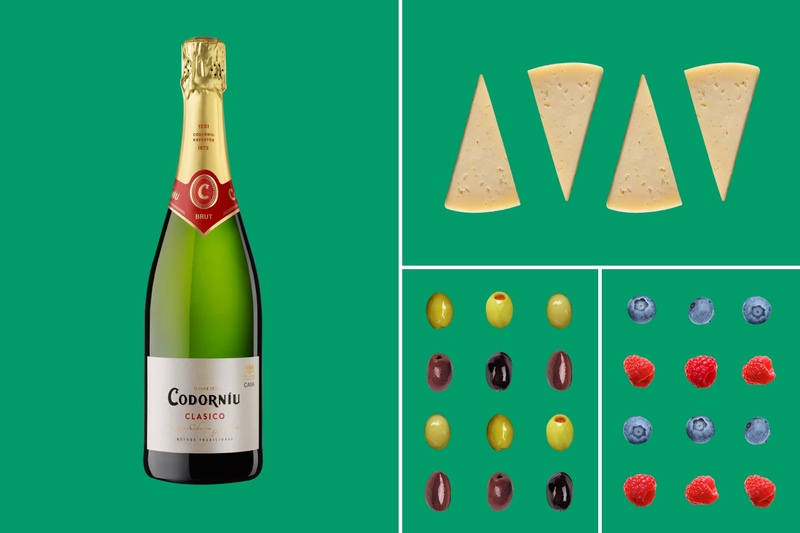 Images: Codorniu, Manchego cheese, Green and Purple olives, Blueberries, Raspberries. Again, we can find a reason to serve any sparkling wine you can think of. They’re all winners here. 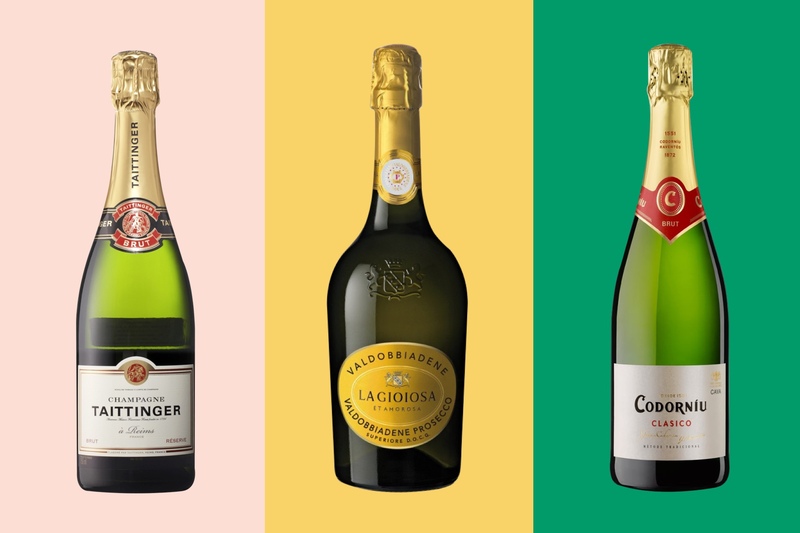 But what we love most about Spanish cava is that it’s a little less dry than the average sparkling wine—that puts it closer to classic champagnes, and farther from the dry, slightly fermented flavor of proseccos. The price point, however, is much more akin to the latter, so enjoy and imbibe with gusto. Hopefully your shopping list isn’t too long, but if you don’t think a trip out is worthwhile, have the drinks come to you. Minibar Delivery is an easy way to have drinks, mixers, and more spirited directly to your house. We’ll sweeten the deal: use code PAPERLESSPOST for $10 off your first order. Now you’re ready to pop some bottles. Throwing a cocktail party or an impromptu happy hour is the perfect alibi.